Firing on all cylinders” was how Mike Smith framed it as he handed down ANZ’s $6.5 billion bell-ringer this week. Have they dropped the Oliver Twist routine, our poor suffering banks? Is it not ”tough out there” any more? The rhetoric from National Australia Bank boss Cameron Clyne was more demure. NAB’s 34 per cent lift in annual profit to $5.4 billion was ”solid”. It was ”pleasing” that profit had climbed in light of ”anaemic” credit growth, said Clyne. Imagine what it will be like when lending picks up again. This presents a conundrum. Dividends bring demand for bank shares; ergo, higher share prices and banker bonuses. As long as interest rates remain low, the party will continue. One thing you can count on is there won’t be a price war. The big four don’t compete on price. If they did, they could not logically belt out record profits year after year in a climate of weak credit growth. How or when the party will all end is anyone’s guess but the ”moral hazard” will prove lethal. And the taxpayer will pick up the chit. 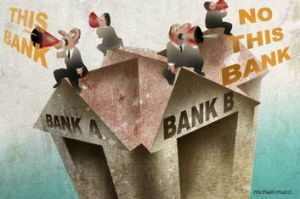 Emboldened by their success – and by their safety net care of the Reserve Bank’s bailout provisions – lending standards have nowhere to go but south. Self-managed super is booming. Allowing SMSFs into residential property is one thing. Allowing them to gear up is another altogether – and every two-bit swindler worth his weight in words is there for the killing. It is sure to end in tears. NAB’s latest offering is its More Give, Less Take campaign, a hotch-potch of pop images and a funky tune that sends the message that this bank is not as predatory as the rest. ANZ’s Buy Ready campaign deploys the tried and true happy-family pitch. There are two families in these ads but only one is ready. The message is superior service, an extension on the Simon Baker campaign that smugly suggests you’re a mug unless you use ANZ. The latest blitz from CBA and Westpac don’t bag their cosy rivals. In the latest manifestation of its CAN campaign, CBA has a star of The Voice TV show, Steve Clisby, singing an uplifting song about people achieving their dreams in life. No mention of banking there. While Westpac’s Home Owns series evokes humour: an annoying little bloke in undies doing bombs in your swimming pool and generally overstaying his welcome. On Thursday he was on the Seven Network’s Today Tonight, which showed footage of him opening an account with betting outfit Ladbrokes. Irvine’s account was open for all of five minutes before someone got back to him and said, sorry, we are closing your account – ”not commercially viable”. Thankfully, the media exposure has revved up independent senator Nick Xenophon, who has pledged to introduce federal legislation to ”override the NT laws which are too slack and too one-sided and too much of an unlevel playing field for these big multinational corporate bookies”.